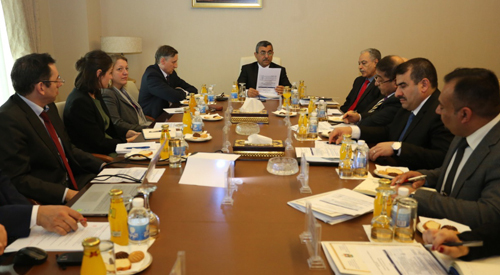 Secretary-General of the Council of Ministers Dr. Mahdi Al-Alak chaired the meeting of the Sixth Steering Committee on German-Iraqi Credit Facilities to Support the Return of Displaced Persons in Iraq (GCFI). During the meeting, the Secretary-General noted the presence of German Ambassador Siril Nan and the President of the Reconstruction Fund Dr. Mustafa Al-Hiti and representatives of the German Development Bank (KFW) and the GOPA Advisory Group, as well as the members of the team from the relevant Ministries of Planning and Finance. That the statistics recorded the return of 70% of the displaced through the implementation of projects to restore stability and rehabilitation of infrastructure in all governorates. The meeting reviewed the position of the investment packages and the progress achieved in the level of activities last year, the mechanisms of coordinating the work in the two stages of restoring stability and reconstruction of the liberated areas during 2019, as well as demining files and tax law and protection of the product and provide advisory support and discuss the most important projects under the budget of 2019. In the context, KfW signed two additional 230 million euro loan agreements on behalf of the German Federal Foreign Office. The funds will be used to finance substations, power lines, bridges, roads and drinking water facilities to support people in the liberated governorates of Dahesh. The first 45 million euro loan agreement was signed to restore power supplies in Mosul and the surrounding area. The GOPA Infra Advisory Group is working to provide and sustainably operate sustainable infrastructure in key areas of engineering, urban development, transportation, transportation and waste management, as well as water and sanitation. Special expertise is used for specialized projects dealing with climate change, post-conflict conditions and migration.